I can not put into words how awesome and powerful this documentary is. This is NOT just an ordinary music documentary, but I would have to write an entire essay to try to convince you otherwise. To attempt to sum up the essence of this film: It shows how teaching and mentorship can truly have a lasting impact on a person’s life. It sounds so generic, but you have to watch the film to even begin to understand how deep that generic statement is. This story is such a palpable testament of the importance of music and arts education in K-12. In the late 60s & 70s, Conrad “Prof” Johnson turns Kashmere High School’s mediocre jazz band out of Houston, Texas, into an unbelievably, tight, funk unit that begin to compete in an all-white, traditional jazz, high school, festival circuit. They eventually start getting gigs in Europe and Japan, but when the administration at Kashmere begin to get jealous of Prof’s success, they pull the funding from his program, and he ends up retiring. 35 years later, in 2008, his students pay tribute to the then 92-year-old Prof. A lot of them hadn’t played their instruments, since graduating, but due to their love of Prof, they were determined to show him that what he had taught them was still within all of them. 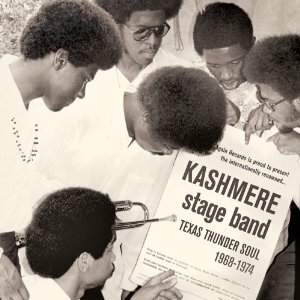 There are a few past members of the Kashmere Stage Band who still make their living through music. The bassist, Gerald L. Calhoun, in particular, is jaw-droppingly, extraordinary. He came all the way from Portugal, Spain, to participate in the reunion. However, what stood out to me, personally, the most, was the integrity and passion that Prof embodies. Luckily, Eothen Alapatt, aka Egon, from Stones Throw is reissuing “lost” funk through his own label, Now Again, and put out a compilation of the band’s recordings. To his credit, Prof had the vision to record his students. He did an annual sound yearbook in a professional recording studio for 8 years straight. So, there is a great deal of audio documentation. You can hear audio samples @ amazon.com, but the live versions are where it’s at. However, listening to the recorded versions do not even begin to light a candle to the live video footage that was featured in the documentary. The Kashmere Stage Band put on shows. They weren’t just playing their instruments. The movement of their steps and instruments were choreographed tighter than a synchronized swimming crew or military unit. I saw it last night at The International House in Philly, and it is still with me. The screening was organized by the Scribe Video Center. Many props to Scribe for bringing it here. It was the first east coast screening, and the only screening in Philly. The director, Mark Landsman, did a Q&A afterwards, and you could tell he really cared about these people. You will, too, after you see it. The Thunder Soul Documentary team is currently trying to secure theatrical distribution. If you are a distributor, make this happen! If you get the opportunity to see this film, don’t miss it for anything! I was there last night and Thunder Soul was dynamite!!!!! I’m an old school funkster and have to say my mind was blown by the story. Great film, great music and great people. But you know, the group that organized the screening was Scribe Video Center, which shows the most interesting films in Philadelphia. Let’s give them props!!! Yes, I will definitely amend my blog and include Scribe Video Center. Thanks for pointing out that glaring, oversight. Wonderful documentary. Wonderful band. It really opened my eyes — err, what am I saying? — **ears** to funk music. I will be researching and listening to it more and more, from now on.